A prototype of an upgraded version of the Tupolev Tu-160 strategic swing-wing bomber was rolled out at the KAPO plant of the United Aircraft Corporation (UAC) in Kazan in mid-November. The first Tu-160M2 is expected to start flight testing by the manufacturer in February 2018, and will later move to the MoD’s State Flight Test Center (GLITS) in Akhtubinsk for further trials. The aircraft looks outwardly similar to earlier versions, but its internal equipment is reported to be 60 percent renewed, including a modern glass cockpit. The new version was first previewed in September 2015, when defense minister Sergei Shoigu said that a first flight would not occur until 2022-2023. But later, the industry signaled its readiness to cut the lead time by producing an “experimental example” from the stock of previously manufactured parts available at KAPO. Despite statements eight years ago by UAC about the type’s production having come to an end, the manufacturing line was not dismantled, but rather preserved. Under the latest plans, KAPO will commence serial production of the Tu-160M2 in 2020-2021. With this new aircraft, the total number of Tu-160 airframes completed so far has risen to 36, starting with the development prototype in 1981. At a gross weight of 275 tonnes, these represent the largest combat jets that ever entered service. 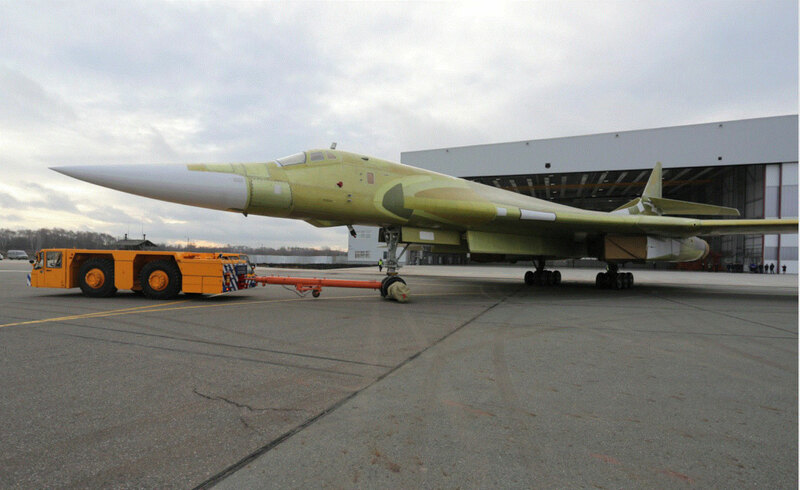 The Tu-160M2 manufacturing line will be set up in stages, according to UAC. Direct investments into renovation of manufacturing tools at KAPO have already exceeded half a billion Roubles ($8.5 million). The industry is instructed to carry out the renovation so that the technologies and manufacturing line at KAPO can later be used for production of the next-generation bomber known as PAKDA, the Russian acronym for Perspective Aviation Complex of Long-Range Aviation. The Tu-160M2 will bridge the gap before the PAKDA becomes available. According to the former commander of the Russian Air and Space Force (VKS) Gen. Victor Bondarev, who now heads the defense committee in the Russian Parliament (“Duma”), the PAKDA’s development is ongoing, but its entry into service “is not the matter for the near future,” as the airplane is not expected to become operational earlier than 2025-2028. Meantime, VKS continues upgrading its operational fleet of 16 Tu-160s into the Tu-160M version with extended lifetime and expanded strike capabilities. So far, five aircraft have undergone the modification, including one earlier this year. Since November 2015, these bombers have been involved in the air campaign against the Islamic State, firing Raduga Kh-555 and Kh-101 long-range missiles at targets in Syria. Expiring lifetimes of Kuznetsov NK-32 engines, whose production terminated in 1993, has been the main issue affecting the Tu-160’s operational availability. In 2006, the industry reported the completion of testing of the improved NK-32-2 (also referred to as NK-32-02) with a new core and a 10 percent reduction in fuel burn. There is no reliable information as to whether any such engines have already been delivered to the military, although on many occasions the industry reported production being up and running and an initial batch of six getting ready.